Graduate student Warren Nanney was awarded a three-year NASA fellowship to continue his research into engineering portable biosensors for health monitoring in space. Warren Nanney, who’s pursuing a Ph.D. in Chemistry and Chemical Biology, received a three-year NASA fellowship that’s creating a unique opportunity for him to develop biosensors that could detect heart attacks before symptoms appear. NASA recently awarded 12 fellowships totaling $1.9 million to graduate students through its Minority University Research and Education Project (MUREP) and Aeronautics Research Mission Directorate (ARMD) to conduct research and contribute directly to NASA’s work and mission. Nanney, a California native, will use his MUREP fellowship to work with researchers at Ames Research Center in Mountain View on a nanofabricated aptamer-based biosensor designed to track biomarkers associated with cardiac disease. The biosensor will be compact and reusable, so it reduces the need for expensive laboratory facilities needed to monitor such markers for heart patients. 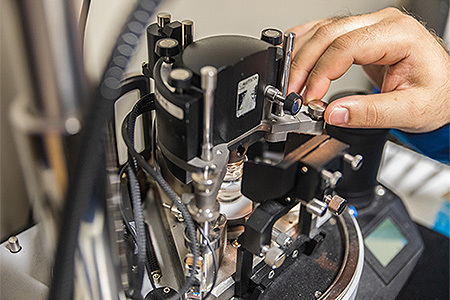 Atomic force microscope Nanney uses to conduct research. Nanney has worked in Professor Tao Ye’s research group for nearly two years. Nanney and Ye are affiliated with Merced nAnomaterials Center of Energy and Sensing (MACES), which fosters and broadens collaborations among faculty and helped to establish several significant collaborative projects with NASA. That association with NASA paved the path for Nanney to apply for the fellowship. Ye credits Nanney’s academic preparation, solid progress in his research project and excellent collaborative skills for his selection from a highly competitive pool of 263 applicants from across the nation. 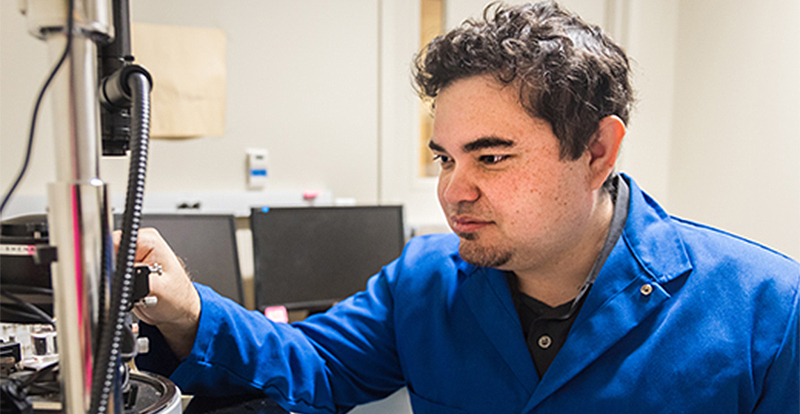 During the spring and fall semesters, Nanney will perform his research at UC Merced and he’ll spend the next three summers at Ames Research Center working under the guidance of Principal Investigator and Senior Scientist Jing Li to develop biosensors that can help monitor stresses of space travel on the human body. The fellowship allows Nanney to be a part of the agency's endeavors in exploration and discovery and helps him fulfill a lifelong aspiration. Warren’s success in this prestigious national fellowship program showcases the unique opportunities and experiences UC Merced is providing to our graduate students.